I got some time to stamp yesterday and just had to pull out my new things from the Summer Smooches package being offered in April. Many of you know that I have what I call “seasonal stampers disorder”. My colors choices are completely and utterly seasonal! I have to say that this beautiful selection of products fits that syndrome beautifully! Just look at the bright, happy colors here! They are just perfect for Margaret Moody’s wonderful sketch over at Pals Paper Arts this week. The Summer Smooches DSP has the most wonderful designs. I thought this pattern would be fun to use with the matching stamp from Bright Blossoms. All I did was mimic the colors from the paper when I stamped the flowers. I matched the little yellow centers from the DSP with a Daffodil Delight brad in the middle of the biggest flower. Easy and fun! For the little flag, I pulled out my trusty Teeny Tiny Wishes for the sentiment. What would I do without that set??!! The card seemed to need something else so out came the handy dandy Mat Pack for some paper piercing. I’m still enjoying all of my Sale-a-bration products and the ones from the Occasions mini but it was nice to get a little preview of the upcoming catalog. The Summer Smooches suite of products will become available on April 1st for one month only (some of the products will only be offered for that month!!). Just wait until you see the little purses made with the new Big Shot die. I’d show you the one I made the other day but it was already taken by a friend of my boys…she just loved it!! I have some great new cards to show you next week! 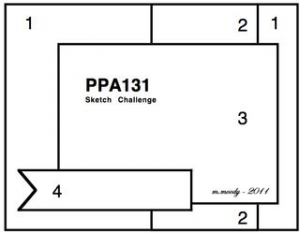 I’ll be back Tuesday with the SUO Challenge and Wednesday with Freshly Made Sketches. Until then, thanks for stopping by. Have a great weekend! Jen, this makes me happy to look at! I like the bright colors, and how you matted everything so neatly. 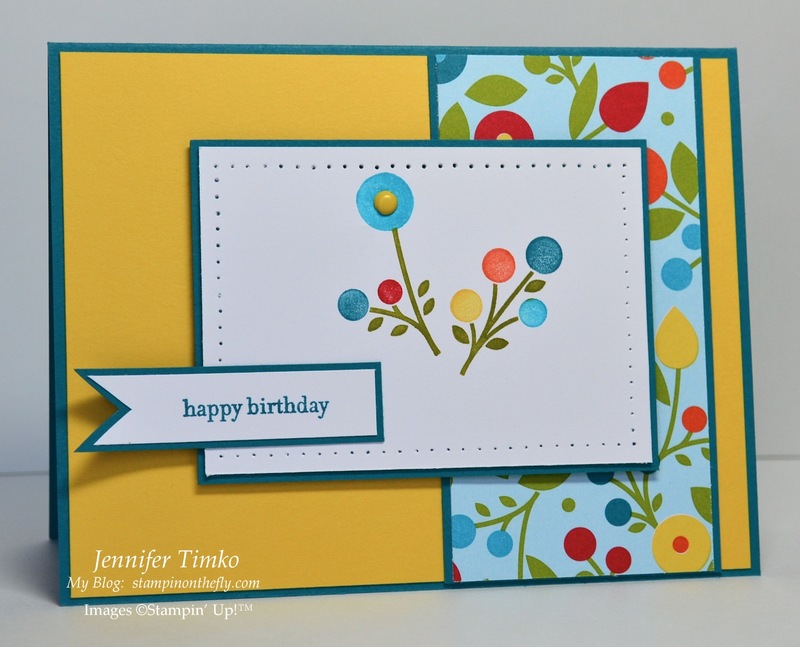 This is a beautiful card – so cheerful! So bright and fun! Love the brad in the center! Yup – it’s SSD all right – love it though! Absolutely gorgeous card! 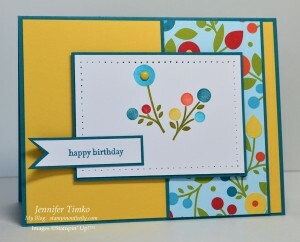 I love the bright colors and how you used the stamp set!! Love this! So bright and cheerful and lovely. That’s a perfect clean and simple card. The colors are fantastic and the paper piercing adds a lovely touch! I feel the same way about Summer Smooches DSP, it definitely will cheer you right up. So will your card, so pretty. I love how you used the brads for flower centers! Great card. Thanks for joining us at the Pals Paper Arts. I agree with all of the comments above: your card is lovely and so so summery! Gorgeous! 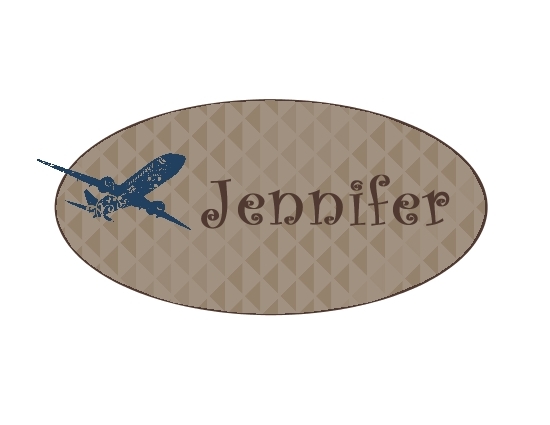 Super cute card, Jen! The colors are just so fun! How cute is this! I am still waiting for my smoochy stuff to arrive! Love how bright and pretty it is! Really, really cute! Love the happy flowers! I am going to have to cave and buy this now! I love it! Very cute and bright (where are my shades?)! Makes me long for spring (warm sunny skies, flowers blooming, birds singing) when I’m stuck in the NW with the coldest weather in the lower 48!!! How fun! Love these colors too!